One of the many sights on my bucket list ticked-off, Mati's Sleeping Dinosuar in Badas Point. With the arrival of Hot D, I never expected to be able to tick it off too soon. It drizzled a few minutes after we made our stop at Badas Point. Being one of the most recognizable sights of Davao Oriental, a stop and photo is a must for me. Sleeping Dinosaur is not hard to find for it is the one and only way to get to Mati City. Public and private vehicles all passes through Badas Point. And you will that you are there, when you see people stopping and taking photographs. Just a piece of advice, do not stop right away the moment you read the Badas Point sign. You will get a better view as you go, simply find a spot that would show the Sleeping Dinosaur in its full glory, which we failed to do. The moment we got back to the car, it was raining hard. See you in our next stop!!! Food and cooking is life. While helping in the preparation of food for the fiesta, Mama Nette notices the aluminum kitchenwares of Tita Vangie. There we learned that she bought those big "kaserola" from Floridablanca. Floridablanca is a first class municipality in Pampanga. Aluminum kitchenware is one of the products that made Floridablanca known for. After visiting Porac's Sandbox, we passed by Brgy. Mabical in Floridablanca. Right after the welcome arch and the bridge are stalls selling aluminum kitchenware. I get to take a hold of a "syanse" as big as my face! But what makes their products unique is that it is hand made using the "palpag" technique. Blessed again to have Mama Nette, she bought me two big "kaserola" and one big "kawali," perfect for more cooking in Aurora's Kitchen. Browie celebrated his 9th birthday with only one wish, "have it at the beach." So the quest of finding a beach resort, that is not as far as Gumasa and a resort we have not been to. Susan's Beach is one of the first, of the few beach resorts along the coastal area of Brgy. Tinoto, Maasim, Sarangani. As of this writing, on our way to Susan's Beach we passed by one of the biggest resort development in Maasim area, "Pacman's Beach Resort." We left Tupi, after 4:00 P.M and reach Susan's Beach past 6 P.M. due to traffic along Calumpang area and the heavy rain. Driving at night along the coastal area of Tinoto needs extra caution because of the winding uphill climb around Tinoto cliff. Susan's Beach is located in Brgy. Tinoto, Maasim, those coming from General Santos City, it is right after Tinoto's fishing village and Elementary School and before going uphill to Lemlunay Resort. 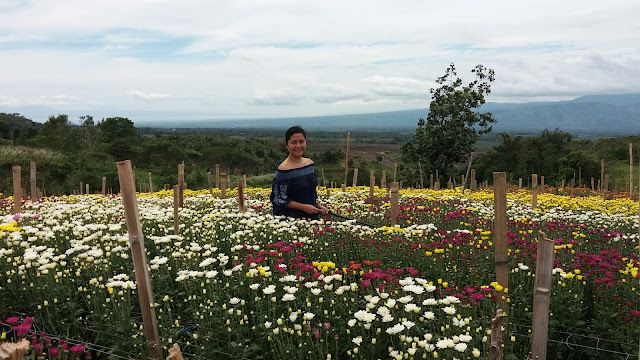 Just before the demand of flowers for All Soul’s Day starts, Eden’s Flower Farm opened their flower fields in Sitio Lemblisong, Kablon, Tupi to visitors. Together with Miya’s friends, Mama, Sissy and I tagged along and played tour guide to them. Eden’s Flower Farm not just opened its beautiful rainbow fields of Malaysian mums for visitors to see and take photos with. They also offer experiences; cutting flowers and harvesting strawberries. Yes Eden’s Flower Farm grows strawberries that they offer to visitors who wants to harvest it. They also offer salad greens vegetables and fruits like banana and papaya for sale.